It is powered with a huge battery capacity of 5000mAh to last the device longer, play games and take selfies. Itel P51 MaxPower is currently not available on Jumia (Nigeria, Kenya, Ghana) - Nigeria's No 1 online store for purchase. Be rest assured of buying quality telecommunication equipment when you shop Itel products on Jumia. They have the best Itel Android phones price and you will also get the best Itel mobile phone accessories in Nigeria, Kenya as well as Ghana. 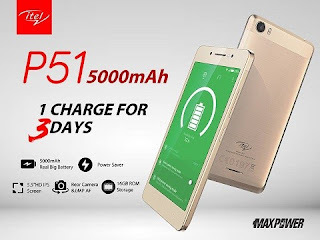 Itel P51 MaxPower price in Nigeria when available should range between N30,000 and N40,000, while the prices in Kenya and Ghana can be gotten by doing a conversion to the local currency. Be sure to get the latest update on this phone as the prices and availability comes in; do bookmark our link or this particular page for quicker notifications or subscribe to our latest posts by clicking here.